Feeding corn silage to finishing cattle is not a foreign concept in the beef industry. In fact, most feedyards’ finishing rations include 5 to 15 percent corn silage for roughage. “Back in the old days, when corn got expensive, corn silage made more sense. I think it still makes sense,” said Galen Erickson, professor at the University of Nebraska-Lincoln, at the 2018 Iowa-Wisconsin Silage Conference held in Dubuque, Iowa. A study completed in the 1970s fed rations that consisted of 10 to 80 percent corn silage. From 10 to 40 percent inclusion, there was a 13 percent bump in feed to gain ratio, which is not desired. “As you increase silage in the diet, there is no doubt that gains drop off some and feed conversion gets worse,” Ericson explained. “Most feedyards don’t want those two things. They want maximum gain and feed conversion,” he added. Erickson conducted a similar trial while he was pursuing his graduate degree. In that study, it was found that there is an 11.4 percent drop in feed conversion between 15 and 45 percent silage in the ration. The cattle, after harvest, were found to be less fat and marbled (intramuscular fat). The major reason behind the low fat and marbling of the cattle, Erickson said, was that there were no by-products included in the ration. Erickson conducted another study where rations contained 15 percent or 45 percent corn silage throughout the finishing period, and a treatment where steers were fed 75 percent for the first half of the finishing period, then 15 percent during the second half. Since past studies had shown that cattle fed 45 percent silage were less fat than cattle fed 15 percent silage, cattle on the elevated silage treatments (45 percent and 75/15 percent) were fed 28 days longer to achieve equal fatness. Cattle that were fed 45 or the 75/15 percent rations had similar intakes, average daily gains (ADG), and feed to gain ratios. Both treatments were lower in ADG and less efficient in feed conversion than cattle fed the 15 percent corn silage ration. “If cattle are going to be fed 45 percent silage in feedlot diets, other technologies may be beneficial if fiber digestion can be improved,” Erickson suggested. Utilizing a brown midrib (BMR) hybrid will boost gains. A recent growing cattle study found that cattle fed BMR hybrids had 3 pounds greater dry matter intake (DMI), which resulted in a 0.6 pounds per day higher ADG. No difference in the feed to gain ratio was seen. Kernel processing is also a key factor. Citing one study, Erickson reported that while ADG was not influenced by kernel processing, a 2.9 percent improvement to feed to gain was observed. Steers were eating less feed but still had the same ADG. “Data suggests that kernel processing of silage is worth about 7.25 percent improvement in feed to gain, assuming the entire change in feed to gain is due to improving the silage fed at 40 percent of the diet,” Erickson concluded. 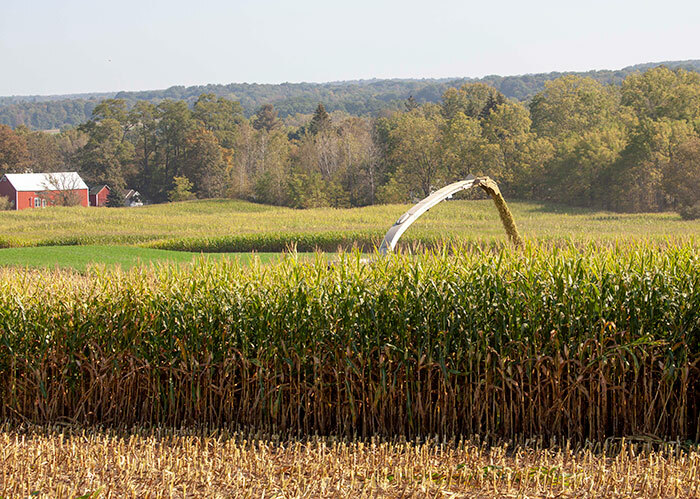 Selecting and evaluating corn silage hybrids can be a daunting task, especially when it comes to what is appropriate for beef cattle. Garland Dahlke, assistant scientist in animal science at Iowa State University, offered guidance and a possible solution at the Iowa-Wisconsin Silage Conference. Grain yield has been the primary decision factor when it comes to selecting a hybrid. But with improved digestibility hybrids of corn, fiber’s ability to provide energy should also be valued. While there are performance calculators available for dairy producers such as Milk06, beef cattle have different requirements. “Beef animals have a slower rumen passage rate than dairy cattle so a 48-hour neutral detergent fiber digestibility (48hNDFd) analysis is better suited,” suggested Dahlke. “Beef feedlot cattle are also fed a higher energy diet than dairy cattle. This diet lowers the rumen pH, which lowers fiber digestibility. Beef cows and stocker cattle generally are fed higher fiber rations, which can maintain a relatively optimal pH for fiber digestion, and therefore, the silage needs to be evaluated in context with the end user,” he added. To help producers make this decision, the Iowa Beef Center has developed a Corn Silage to Beef calculator that is available on their website.